Instead of agonizing over what was going wrong, I decided to take the other angle: What is going right? What young people are sticking around? Why? What, in their histories has brought them to a place of devotion to Jesus Christ and the Church? In asking these questions, I have encountered many diverse young people who are thriving in Orthodoxy. They each have unique stories of faith and discovery and sacrifice. In this series, I chronicle their stories in the hope of inspiring you as you raise your own children and god children in the Faith. I first saw Isabelle a year ago when she showed up at my home parish. She was alone and didn’t look a day over 20. Our church is about a mile from the city center and slightly off the beaten path which means most people don’t just stumble into our doors. Usually, they are searching. That was the case with Isabelle. As I introduced myself the next Sunday, I discovered that Isabelle was a Berry College student and that she drove an hour and 10 minutes each way to attend! That’s impressive. I know people who live within 15 minutes and cannot get out of bed on a Sunday. So, I knew immediately there was something refreshingly different about Isabelle. I was right. I started seeing her in the bookstore asking questions. She was a sponge, asking about the Eucharist and baptism and the Liturgy. Within two months of attending, she was made a catechumen. She attended much of the Holy Week services and studied diligently under our priest to learn the faith. In September she was baptized and fully Chrismated into the church. Since we’ve become good friends, I asked her to sit with me so that I could ask her a few questions. “What got you started on this journey? How did you find the ancient faith?” I asked one recent evening. “My brother, Will, is responsible,” she said. “He started reading about Orthodoxy when he was at VMI and found an OCF (Orthodox Christian Fellowship) on campus there and got involved. He intrigued us all with this shift,” she said. “But, back up. What was your faith background growing up?” I asked. “My parents decided to make the switch to Orthodoxy last year because they liked the changes they saw in Will, the fact that he liked it so much,” she added. “So, your whole family is Orthodox now?” I asked. “My younger brother just became a catechumen, so everyone except my oldest sister who lives in Wisconsin,” she added. As she told me this, I couldn’t stop thinking about how God used Will to bring this precious family to His church. It happens just in this way. “How did you find St. Basil’s? It isn’t necessarily convenient for you to attend,” I asked. “I have been looking for this my whole life,” she said. That was the answer. She’s been searching and she found what she was looking for. Her parents planted seeds that stuck around and grew into a need. Her brother led the family in converting and her parents saw the gem that was Orthodoxy and came on board. On its surface, the story is a simple one, not unlike most of our own. But in reviewing it, I see God’s hand guiding and showing the clear path to a family who was seeking after Him. His hand aligned all of the paths and people and circumstances to facilitate their joyful conversion! Like the birth of a baby, it is a wonder and a mystery that is beautiful and real. So, what was my take away from this conversation with Isabelle? Is it possible to apply any of this to my own parenting and encouraging of others? Perhaps the lesson to me is to keep planting seeds. I need to keep encouraging and nudging my kids and god children to be in church and to seek after God and Truth. And, I need to be reminded that God will work this out. He is the Director of paths and the Giver of Truth. Graduating this May, Isabelle is a senior at Berry College in Rome, Georgia. Among other things, she runs our church website and is on the leadership committee for the Connect Orthodox Young Adult Conference. 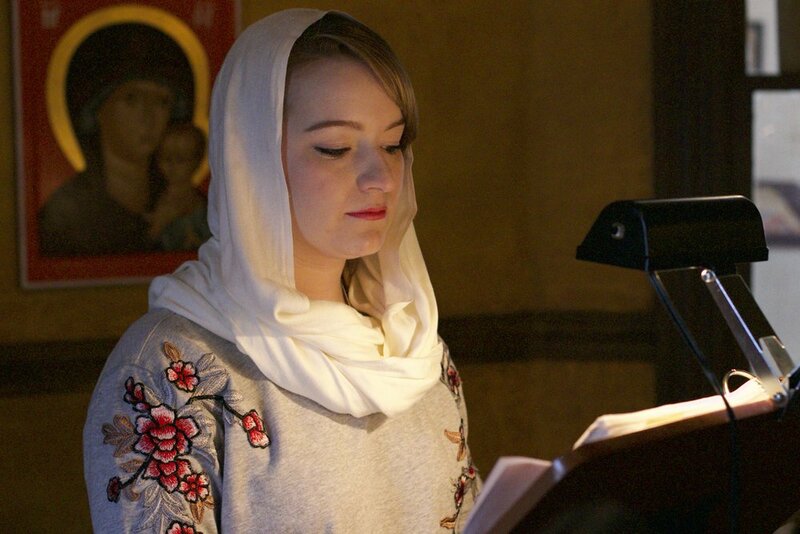 Her story is remarkable, and I hope you are inspired by this young woman who is thriving in the Orthodox faith.